Have Christians become so preoccupied with "major" sins that we have lost sight of our need to deal with more subtle sins? 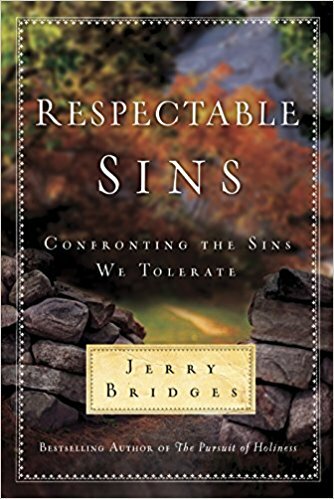 Navigator author Jerry Bridges addresses the “acceptable” sins that we tend to tolerate in ourselves, including pride and anger. He goes to the heart of the matter, exploring our feelings of shame and grief and opening a new door to God's forgiveness and grace. It's easy to slip through life without taking any risks-without making your life count. But life ought not be wasted. You don't need to know a lot of things to make a lasting difference in the world, but you do have to know the few, great, unchanging, and glorious things that matter and be willing to live and to die for them. John Piper's plea to a generation is, "Don't waste your life!" This book is a passionate call to make your life count for eternity. He acknowledges that there are risks for those who seek to make a lasting difference by faith, yet he believes that they are risks worth taking for the cause of the Gospel. Each book includes a DVD featuring Piper speaking on this topic. If you believe that to live is Christ and to die is gain, read this book, learn to live for Christ, and grab the opportunity to make your life matter! The first edition of The Gospel According to Jesus won wide acclaim in confronting the 'easy-believism' that has characterized some aspects of evangelical Christianity. Over the past 50 years, a handful of books have become true classics, revered world-wide for their crystal-clear presentation of the Gospel and lauded for their contribution to the Christian faith. These extraordinary books are read, re-read, and discussed in churches, Bible study groups, and homes everywhere. John MacArthur's The Gospel According to Jesus is one of those books. In The Gospel According to Jesus, MacArthur tackles the idea of 'easy believism,' challenging Christians to re-evaluate their commitment to Christ by examining their fruits. MacArthur asks, 'What does it really mean to be saved?' He urges readers to understand that their conversion was more than a mere point in time, that, by definition, it includes a lifetime of obediently walking with Jesus as Lord. This 20th anniversary edition of MacArthur's provocative, Scripture-based book contains one new chapter and is further revised to provide Christians in the 21st century a fresh perspective on the intrinsic relationship between faith and works, clearly revealing Why Jesus is both Savior and Lord to all who believe. Christian Essentials Made Plain and Simple God doesn't call every Christian to go off to seminary, but there are certain matters of doctrine---that is, the church's teaching---that every Christian simply must know. Theology is important because what we believe affects how we live. If you're a relatively new believer in Jesus, or if you're a more mature Christian looking for a quick brush-up on basics of the faith, Christian Beliefs is for you. This readable guide to twenty basic Christian beliefs is a condensation of Wayne Grudem's award-winning book on systematic theology, prized by pastors and teachers everywhere. He and his son, Elliot, have boiled down the essentials of Christian theology for the average layperson and made them both clear and applicable to life. You will learn about the Bible, the characteristics of God, what it means that we are created in the image of God, what God has done for us in Christ, the purpose of the church, and much more.